We continue to see corruption everywhere: throughout the highest levels of government, in our entertainments, in our schools, and even in many of our churches. Many of those in the corridors of power should be incarcerated for treason—legislators that sign bills they haven’t read; executives who are allowed to ignore the laws; judges who reverse juries, amend laws, and indulge in social engineering; and, leaders who fail to exhibit the most elementary ethical conduct. The entertainment industry celebrates every imaginable evil and attacks all the family values which God has established for our welfare. And the educational establishment deliberately dumbs down and corrupts our youth. There was a day when you could rely on the fiduciary posture of your advisors, counselors, and professionals. Today that would be naïve and hazardous. Every day the litany of unconstitutional abuses continues unabated. Every day self-destructive polices extend their reach. Every day it grows darker. Every day the debts grow larger; they are already beyond any semblance of reality. As the centroid of geopolitical power on the Planet Earth continues its shift westward (abandoning the U.S.), you can also see a cloud of spiritual darkness emerging on our eastern horizon. Europe, mired in the grip of socialism, is now also discovering the sinister agenda—and deadly demographics—of Islam. The Middle East continues to boil, and an Islamic Caliphate is threatening lives and freedoms everywhere. A growing barrage of crises continue to escalate while the entire global financial system is increasingly ready to implode. This is a well-planned situation wherein millions of illegals (including children and terrorists) are being allowed across the U.S. border—with huge potential for economic and social destabilization of the country—and of course, eventually millions of Democrat votes. This invasion was created by someone (or some group) who wants to destabilize and destroy the U.S. There will ultimately be 5–8 million new illegals in America via this current influx. The present war began when Hamas began firing thousands of rockets from Gaza into Israel. Israel did what any country would do to protect itself—it launched a counterattack into Gaza to stop the Hamas missiles. In its offensive against Hamas, the IDF (Israeli Defense Force) found dozens of infiltration tunnels into Israeli from Gaza—some of them dug to Israeli elementary schools—where Hamas planned to kidnap hundreds of Israeli children and hold them as hostages. ISIS has captured numerous Iraqi military bases and massive quantities of sophisticated U.S. weapons with which we equipped the Iraqi military over the past ten years. These include hundreds of ground-to-air missiles that can ultimately be used to shoot down civilian airliners all over the world. ISIS briefly captured the largest dam in Iraq, which temporarily put it in a position to cut off all water supplies to Baghdad. ISIS is now threatening to overthrow the very weak and ineffective Iraqi government installed by America after the ill-advised 2003 invasion of Iraq. If successful, Syria and Jordon are likely to fall next, and even Saudi Arabia (where help for ISIS has come from) may be in danger. The British SAS is being flown in to help rescue 30,000 fleeing Iraqi Christians and other minorities who are trapped in Northern Iraq. This crisis was precipitated when the U.S. government under Obama helped to overthrow the pro-Russian government in the Ukraine and install a pro-U.S., anti-Russian regime in Kiev. America is the driving force behind moving NATO forces and missiles near the Russian border, and behind the sanctions against Russia—with Europe reluctantly going along with the U.S. until the shooting down of the MH17 airliner. Who was really behind the shooting down of that airliner? Certainly the Ukrainian government and the U.S. had the most to gain, and Putin and the rebels had the most to lose. Maybe Russia’s abandoning the U.S. dollar may be impacting America’s current belligerent policies toward Russia (like Saddam Hussein and Muammar Khadafy were trying to do before we overthrew them and had them killed). The political left in America (via the Obama regime and the controlled liberal media) are working overtime to stir up hatred and division between the black and white races. Massive race riots in major American cities, as millions of unemployed young blacks roam the streets and the political left keeps stirring the racial pot, are a growing potential. Overnight, martial law and a state of national emergency could be declared. The U.S. debt was $222 trillion at last count,  and growing: $17.5 trillion current, national debt; plus unfunded liabilities for Social Security, Medicaid, and other entitlement programs (growing at $2.2 billion per day.) This amounts to almost $500,000 for every man, woman, and child. The U.S. government borrows four out of every ten dollars it spends. McKinsey Global Institute calculates that the total wealth of the world is estimated at $200 trillion. The U.S. fiscal gap is 11% larger than all the accumulated wealth existing in the world today! The cancer of an entitlement mentality has even infected the middle class. The growing dependence on government handouts ignores the reality that the only assets the government has are yours. To fulfill the growing collective expectations they will increasingly confiscate your assets to fulfill their ambitions. The problem with socialism is that you soon run out of other people’s money. Food stamp assistance grew from 17.2 million recipients in 2000 to 47.7 million in 2013 (one in seven Americans)! Where’s the “recovery”? Eleven million U.S. citizens today receive disability payments, 57.6 million receive Social Security (and growing rapidly), and 82 million households are on Medicaid. It’s not our job to predict the future (divination is prohibited in the Torah). It is our responsibility to prepare for coming storms. Those who ignore history are doomed to repeat it. America likewise has now become the victim of a leadership committed to everything we once abhorred. Every time I pass a military cemetery I’m reminded that it is filled with the bodies of patriots who gave their lives fighting everything that our current leadership is now committed to. Our founders worked very hard to avoid the instabilities of a “democracy”: it was liberty and freedom that garnered their sacrifices. It was a constitutional republic they gave us—but our complacency and apathy has allowed it to get trampled into the dust of myopic expediencies. It is debatable whether it can ever be reestablished. One of the most extraordinary documents in human history—the Bill of Rights—has come to an end under President Barack Obama. Derived from sacred principles of natural law, the Bill of Rights came to a sudden and catastrophic end when the President signed the National Defense Authorization Act (2012 NDAA Sec. 1021), which grants the U.S. military the “legal” right to conduct secret kidnappings of U.S. citizens, followed by indefinite detention, interrogation, torture and even murder. This is an evaporation of the very foundation of the U.S. Constitution: Separation of Powers; Rule of Law; Habeas Corpus; Posse Comitatus; Trial by Jury; Common Law (vs. Civil Law). Both Washington and Wall Street are desperately trying to create the impression of a recovery. They insist on measuring progress on consumption (CPI) rather than production. The difference—the deficit—is debt. America is now the world’s largest debtor, frantically printing currency expecting that the foreign banks are foolish enough to overlook its eroding value: it’s the “greater fool theory” on steroids. There was a time when God clearly blessed America. However, we then outlawed Him from our schools and public places. We allowed our kids to be taught that the Creation itself was some kind of cosmic accident. We shredded the fundamentals of life: marriage, fidelity, and the sanctity of commitments—in our marriages and other relationships. Now we wonder why our kids have no sense of destiny. They can’t even find a job! Cities and states are going bankrupt; law enforcement is unpaid; crime will increase. Critical requirements will be harder to come by. Martial law can be expected. What do we DO? We have an answer that may surprise you. It is only for the truly serious and committed. 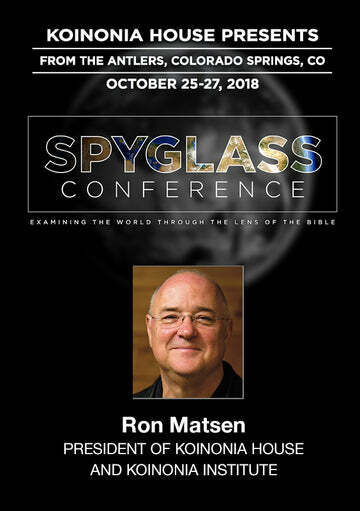 We will be describing it in the articles that will follow monthly, and at our annual Strategic Perspectives Conference in Coeur d’Alene, Idaho, October 23–25. Join us in person or by watching the streaming on the Internet. See http://kitrust.org/store/product/651 or https://koinoniainstitute.org/conference/registration/. October 2014 Personal Update News Journal.